Hello everyone! I hope you are having a wonderful October 1st. The Halloween season is fast approaching (though I've had my Halloween decor up for a few weeks now) I did reach my goal of finishing Happy Halloween before today! I finished all the stitching! I also "signed it" after I took this picture (in the bottom right corner, DNA 2014 in the same color as the N). Now I have to decide how to finish it. I was originally thinking a flat fold like the one further down in this post, but I don't know if I could do it justice. Then I was thinking about framing it, but it's 6 x 7 inches. So while I could put it in an 8 x 10 frame, I would want a mat too and I don't think that's enough room. Dilemma! Let me know what you would do in the comments! My super awesome friend (Kathleen, no blog) came over last night for a crafty night! She is working on a baby blanket that she is crocheting and then doing cross stitch on! It's actually super cool and I had never thought about doing that! We might make this a weekly or bi-weekly thing! Which would be super cool. We would both be motivating each other. I was able to get a lot done on my finishing. Keep in mind that both of these are only partially finished. The Jolly Jack needs cording around the edges to make it look neater (I'm thinking of making some in orange colors) and the pillow needs stuffing. I'm not totally pleased with the A frame flat fold, but for my first time I think it was pretty good. And I had to sew the ric-rak on by hand for the pillow and I think it turned out super well! Once I have both totally finished I'll probably share them again. They are both so cute. I'm so excited to actually finish-finish things! I don't have a big drawer filled with unfinished but totally stitched things. I do have a drawer with unfinished cross stitching though. Everyone does. Right?! 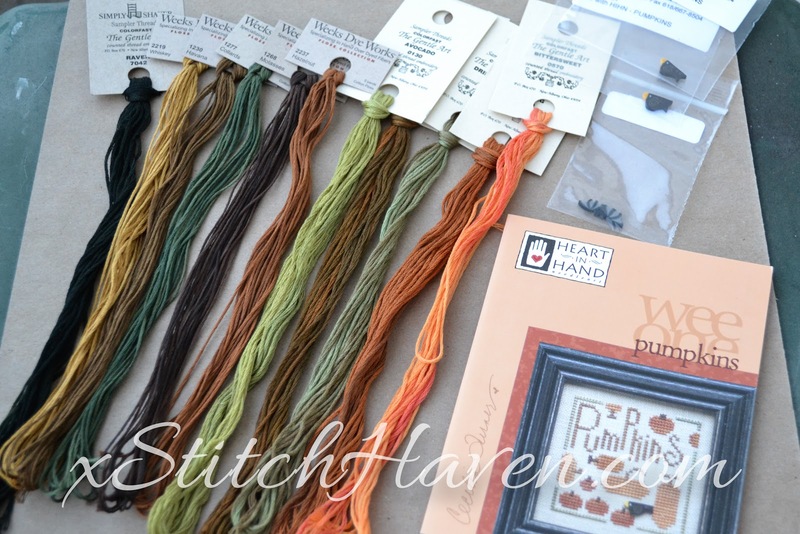 I also bought some more Weeks Dye Works thread for some additional small patterns in the Just Cross Stitch Halloween 2013 magazine. And a pattern just fell into my cart. I have no idea how that happened! The pattern called for some Just Another Button Company buttons so I bought two in case I decided to make it twice, once for myself and once for my MIL. We'll see. Oh for my Ocober Mini Madness I think I'm going to work on those various Halloween pattersns I mentioned earlier. :) I don't know if my finishing of that Lizzie Kate counted, but yeah, I'm ready!!! 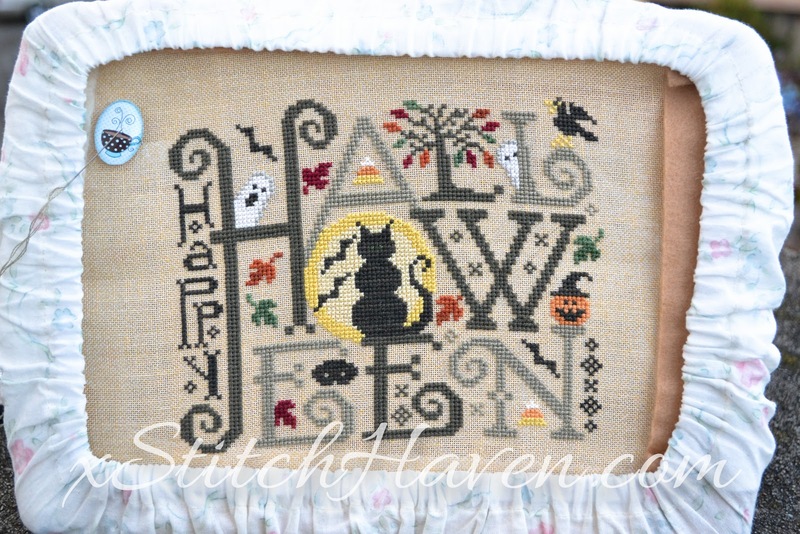 How are you coming along with your Halloween stitching (if you do any)? And what are you thoughts on finishing my Happy Halloween? Let me know in the comments! These are really fabulous pieces! I think your flatfold really came out well. Did you end up using matboard or something else? Oh, such pretty finishes, oh, what pretty thread! And Happy Halloween is absolutely awesome, I'm totally in love with how it turned out. Maybe you could do some kind of wall/door hanger to display it? Wonderful finishes!! Maybe one of those cube finishes for the Happy Halloween? I am finishing challenged, but I have thought I "might" be able to make one of those--I do like how they look. You finished HOURS before me!!! I like you made some of your leaves green! I had to double check my chart to make sure I didn't make a mistake!!!!! I was thinking of a flat fold finish as well ... or maybe a cube??? If I framed it I would have to go custom because of the odd sizing, putting it in a standard frame would just drive me up the wall! Halloween finished up so cute, I've seen this one posted by quite a few people lately and enjoy it each time, really think I need to pull out my copy of that issue and do it. Jolly Jack finished up wonderfully too, what a fun flat fold. Your Halloween finish is wonderful! I want to start mine but have no time to fit it into my rotation just yet! Your other finishes look lovely. 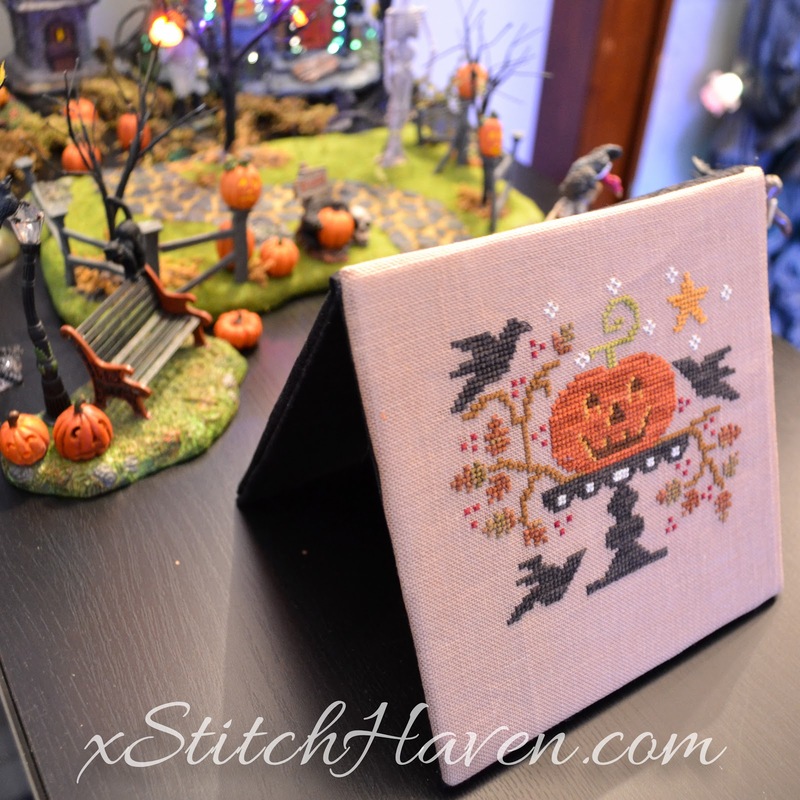 I love your Halloween stitching! Too, too cute!! 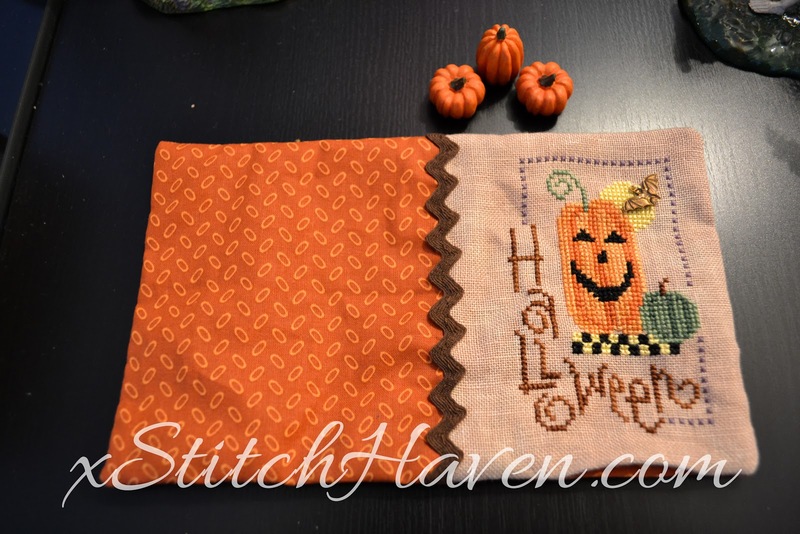 OMG, your Halloween stitching is too awesome! Killing me! And I do want to try a flatfold, I think yours looks great!